Over the years we have tried to make this the most comprehensive list of terminology for foods one might find at a sushi restaurant. While we have worked hard, this list is by no means complete and we would love to hear any suggestion for additions from find in a Japanese restaurant. We thought to include items found in sushi, sashimi, courses, beverages, and accompaniments. You may notice that some of these items are links. Click on these links to go to a page devoted to that particular item to learn more about it and view images. Please contact us with anything you would like us to include that we may have missed. Looking for sushi grade seafood online? Catalina Offshore Products has the best sushi grade seafood available, in my opinion. Visit Catalina for almost everything you could ever want. Abura Bouzu - ah-boo-rah boh-zoo) or Abura Sokomutsu (ah-boo-rah soh-koh-moo-tsoo) – This is Escolar (Oilfish) and sometimes called Shiro Maguro, although it is not tuna and should not be confused with that fish. Bright white in color and quite fatty, this fish is not always easy to find. Due to the high levels of fatty esters, this particular fish may cause digestive issues with some individuals, and for that reason has been prohibited in Japan since the 1970′s. If your body can tolerate it, the creamy texture and clean taste can be quite appealing. While escolar can be found called Abura Bouzu, this is in fact a different fish, called the "skilfish. Aburage - ah-boo-rah-ah-geh)-Fried tofu pouches usually prepared by cooking in sweet cooking sake, shoyu, and dashi. Used in various dishes, in Miso Shiru and for Inari Zushi. Aemono - ah-eh-moh-noh) -Vegetables (sometimes meats) mixed with a dressing or sauce. Agari - ah-gah-ree) – A Japanese sushi-bar term for green tea. Agemono - ah-geh-moh-noh) – Fried foods — either deep-fat fried or pan-fried. Ahi - aaa-hee) – Yellowfin Tuna. Aji - ah-jee) - Horse mackerel, Jack Mackerel (less fishy tasting than Spanish mackerel). Purportedly this is not actually a mackerel, but member of the Jack family. It is small – about 6" in length and they fillet it and serve marinated in vinegar. Aji-no-moto - ah-jee-no-moh-toh) – Monosodium glutamate (MSG). Aka miso - ah-ka-mee-soh) – Red soy bean paste. Akagai - ah-ka-gah-ee) – Pepitona clam, red in colour, not always available. Akami - ah-kah-me) – the leaner flesh of tuna from the sides of the fish. If you ask for ‘maguro’ at a restaurant you will get this cut. Ama Ebi - ah-mah-eh-bee) – Sweet Shrimp, Red Prawns. Always served raw on nigirizushi. Sometimes served with the deep-fried shells of the shrimp. Eat the shells like you would crayfish. An - ahn) – Sweetened puree of cooked red beans. Also called Anko, thought not to be confused with Monkfish, also called Anko, but contextually the difference will be apparent to Japanese speakers. Anago - ah-nah-goh) – Salt water eel (a type of conger eel) pre-cooked (boiled) and then grilled before serving, less rich than unagi (fresh water eel). Ankimo - ahn-kee-moh) - Monkfish liver, usually served cold after being steamed or poached in sake. Aoyagi - ah-oh-yah-gee) – Round clam. Also called Hen Clam. Awabi - ah-wah-bee) – abalone. Ayu - ah-yoo) – Sweetfish. A small member of the trout family indigenous to Japan, usually grilled. Azuki - ah-zoo-kee) – Small red beans used to make an. Azuki connotes uncooked form. Beni shoga - beh-nee shoh-gah)- Red pickled ginger. Used for Inari Zushi, Futomaki, and Chirashizushi, but not for Nigirizushi. Bonito - bo-nee-toh) – See Katsuo (kah-tsoo-oh). Buri - boo-ree) – Yellowtail. Hamachi refers to the young yellowtail and Buri are the older ones. Buri Toro - boo-ree toh-roh) – Fatty Yellowtail. The belly strip of the yellowtail. Incredibly rich with a nice buttery flavour. Butaniku - boo-ta-nee-koo) – Pork. Buta means pig. 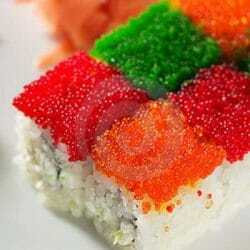 California Roll - maki) A California roll is an american style roll created in California for the American palate. It usually consists of kamaboko (imitation crab meat) and avocado, sometimes including cucumber. Chikuwa - chee-koo-wah) – Browned fish cake with a hole running through its length. Chirashi-zushi - chee-ra-shee-zoo-shee) – translates as "scattered sushi", a bowl or box of sushi rice topped with a variety of sashimi. Chutoro - choo-toh-roh) – The belly area of the tuna along the side of the fish between the Akami and the Otoro. Often preferred because it is fatty but not as fatty as Otoro. Daikon - Dah-ee-kohn) – giant white radish, usually served grated as garnish for sashimi. Dashi - dah-shee) – Basic soup and cooking stock usually made from, or from a combination of Iriko (dried Anchovies), Konbu (type of Kelp) and Katsuobushi (dried bonito flakes). However any form of stock can be called “dashi”. Donburi - dohn-boo-ree) – A large bowl for noodle and rice dishes. Also refers specifically to a rice dish served in such a large bowl with with the main items placed on top of the rice, Examples include Tendon (Tenpura Donburi) and Unadon (Unagi Donburi). Ebi - eh-bee) – Shrimp. Not the same as Sweet Shrimp, as Ebi is cooked, while Ami Ebi is served in raw form. Edamame - eh-dah-mah-meh) – Young green soybeans served steamed and salted and usually still in the pod. Fugu - foo-goo) – Fugu is puffer fish which is a delicacy, though its innards and blood contain extremely poisonous tetrodotoxin. In Japan only licensed fugu chefs are allowed to prepare fugu or puffer fish. Fuki - foo-kee) – Fuki is a Japanese butterbur plant which contains a bitter substance called "fukinon" (a kind of ketone compound), but upon blanching fukinon is easily washed out from its petioles (edible parts) and is prepared for an excellent Japanese vegetable dish. Futo-Maki - foo-toh-mah-kee) – Big, oversized rolls. Gari - gah-ree) – Pickled ginger (the pink or off-white stuff) that comes along with Sushi. Gobo - goh-boh) – Long, slender burdock root. Gohan - goh-hahn) – Plain boiled rice. Goma - goh-mah) – Sesame seeds. Gunkan-maki - goon-kahn-mah-kee) – Battleship roll. This is where the maki is rolled to form a container for the liquid or soft neta. Used for oysters, uni, quail eggs, ikura, tobiko, etc. Gyoza - gi-yoh-zah) – A filled wanton dumpling that has been either fried or boiled. Ha-Gatsuo - ha gat-soo-oh) – Skipjack tuna. This meat is similar to bonito but is a lighter, pinker product. Hamachi - hah-mah-chee) – Young Yellowtail tuna, or amberjack, worth asking for if not on menu. Hamaguri - hah-mah-goo-ree) – Hard shell Clam. Includes American littlenecks and cherrystones. Hamo - hah-moh) – Pike Conger Eel. Indigenous to Japan. Hanakatsuo - hah-nah-kah-tsoo-oh) – Dried bonito fish, shaved or flaked. Usually sold in a bag. Also called Katsuobushi (bonito flakes). Harusame - hah-roo-sah-meh) – Thin, transparent bean gelatin noodles. Hashi - hah-shee) – Chopsticks. Also called O-Hashi. Hatahata - hah-tah-hah-tah) – Sandfish. Indigenous to Northern Japan. Hijiki - hee-jee-kee) - Black seaweed in tiny threads. Hikari-mono - hee-kah-ree-mo-no) - A comprehensive term for all the shiny fish. However usually refers to the shiny oily fish, such as Aji, Iwashi, Sanma, Kohada. Himo - hee-moh) - The fringe around the outer part of any clam. Hirame - hee-rah-meh) – Generally speaking this name is used for many types of flat fish, specifically fluke or summer flounder. The name for winter flounder is really "karei" (kah-ray), but often restaurants do not discriminate between fluke or summer flounder when one asks for hirame. Some restaurants call halibut "hirame," however the actual Japanese word for halibut is "ohyo" (oh-yoh). Hokkigai - hohk-kee-gah-ee) - Surf Clam (also called Hokkyokugai). Sort of a thorn-shaped piece, with red coloring on one side. Hotate-Gai - hoh-tah-teh-gah-ee) – Scallops. Ika - ee-kah) – Squid. As sushi or sashimi the body is eaten raw and the tentacles are usually served parboiled then grilled or toasted. Ikura - ee-koo-rah) – salmon roe. (FYI, Ikura means ‘How much?’ in Japanese) The word Ikura is shared with the Russian word “Ikra” meaning salmon roe. Inada - ee-nah-dah) - Very young yellowtail. Inari-Zushi - ee-nah-ree-zoo-shee) – [see an image] – Aburage stuffed with sushi rice. Kaibashira - kah-ee-bah-shee-rah) – large scallops, actually giant clam adductor muscle, though often scallops are served, much like cooked scallops but more tender and sweeter. Kobashiri are small scallops and like kaibashira may or may not come from scallops or other bivalves. Kajiki - kah-jee-kee) – Billfish including Swordfish and Marlins. Swordfish specifically is called Me-Kajiki or Kajiki-Maguro. Kaki - kah-kee) – Oysters. Kamaboko - kah-mah-boh-ko) – Imitation crab meat (also called surimi) usually made from pollack. Generally used in California rolls and other maki, it’s not the same thing as "soft shell crab." Kampyo - kahn-piyoh) – Dried gourd. Unprepared is a light tan color. Prepared it’s a translucent brown. It comes in long strips, shaped like fettuccine. Kani - kah-nee) – Crab meat. The real stuff. Always served cooked, much better if cooked fresh but usually cooked and then frozen. Kanpachi - kahn-pa-chi) – Greater Amberjack. This is similar to hamachi, but this is actually a different fish (and is not Yellowtail or the Japanese Amberjack). Karasu Garei - kah-rah-soo gah-ray) – Literally translated this means "cow flounder" and is the term for Atlantic halibut. Karei - kah-reh-ee) – Winter flounder. Katsuo - kah-tsoo-oh) – Bonito. It is usually found in sushi bars on the West Coast because it lives in the Pacific Ocean, and doesn’t freeze very well. Sometimes confused with Skipjack Tuna, which is incorrect as Skipjack Tuna is called "ha-gatsuo." Katsuobushi - kah-tsoo-oh boo-shi) - Bonito flakes. Smoked and dried blocks of skipjack tuna (katsuo) that are shaved and uses usually to make dashi, or stock. Kazunoko - kah-zoo-noh-koh) – herring roe, usually served marinated in sake, broth, and soy sauce, sometimes served raw, kazunoko konbu. Kohada - koh-hah-dah) – Japanese shad (or young punctatus, it’s Latin species name). Kohada is the name when marinated and used as sushi neta. Prior to this the fish is called Konoshiro (ko-no-shee-roh). Kuro goma - koo-roh-goh-mah) – Black sesame seeds. Akami (ah-kah-me) - the leaner flesh from the sides of the fish. If you ask for 'maguro' at a restaurant you will get this cut. Chu toro (choo-toh-roh) - The belly area of the tuna along the side of the fish between the Akami and the Otoro. Often preferred because it is fatty but not as fatty as Otoro. O toro (oh-toh-roh) - The fattiest portion of the tuna, found on the underside of the fish. Toro (toh-roh) is the generic term for the fatty part of the tuna (either chutoro or otoro) versus the 'akami' portion of the cut. Maki-zushi - mah-kee-zoo-shee) – The rice and seaweed rolls with fish and/or vegetables. Most maki places the nori on the outside, but some, like the California and rainbow rolls, place the rice on the outside. Makisu - mah-kee-soo) – Mat made of bamboo strips to create make-zushi. Masago - mah-sah-goh) – capelin (smelt) roe, very similar to tobiko but slightly more orange in colour, not as common as tobiko in North America (though often caught here). Capelin, shishamo, is also served grilled (after being lightly salted) whole with the roe in it as an appetizer. Matoudai - mah-toh-dai) – John Dory. Mirin - mee-rin) – Sweet rice wine for cooking. Mirugai - mee-roo-ghai) – Geoduck or horseneck clam, slightly crunchy and sweet. Miso - mee-soh) – Soy bean paste. Moyashi - moh-yah-shee) – Bean sprouts. Murasaki - moo-rah-sah-kee) – meaning “purple” an old “sushi term” for Shoyu. Namako - nah-mah-koh) – Sea cucumber. This is much harder to find in North America than in Japan. As a variation, the pickled/cured entrails, konowata (koh-noh-wah-tah), can be found for the more adventurous diners. The liver, anago no kimo (ah-nah-goh noh kee-moh) is served standalone as well. Nasu - nah-soo) – Eggplant. Also called Nasubi. Natto - naht-toh) – Fermented soy beans. (Not just for breakfast anymore) Very strong smell and taste, also slimy. Most people don’t like it. Order it once, if for no other reason that to see the confused look of the chef. Negi - neh-gee) – Green Onion. Scallion. Round onion is called Tama-negi. Neta - neh-tah) – The piece of fish that is placed on top of the sushi rice for nigiri. Nigiri-zushi - nee-ghee-ree-zoo-shee) - The little fingers of rice topped with wasabi and a filet of raw or cooked fish or shellfish. Generally the most common form of sushi you will see outside of Japan. Nori - noh-ree) – Sheets of dried seaweed used in maki. Ocha - oh-chah) – Tea. Odori ebi - oh-doh-ree-eh-bee) - (‘Dancing shrimp’)- large prawns served still alive. Ohyo - oh-hyoh) – Pacific halibut, sometimes incorrectly labeled "dohyo." Atlantic halibut is called Karasu Garei. Ono - oh-noh) Wahoo. As much fun to catch as to eat, ono (Hawaiian for ‘delicious’) has a very white flesh with a delicate consistency, similar to a white hamachi (yellowtail). Oshi-zushi - oh-shww-zoo-shee) – Sushi made from rice pressed in a box or mold. Oshibako - oh-shee-bah-koh) - Used for pressing the sushi to make Oshi-zushi. Oshibori - oh-shee-boh-ree) – The wet towel one cleans one’s hands with before the meal. Oshinko - oh-shin-ko) - A general term for the many and varied pickled vegetables that are not uncommon at the table in Japanese dining, and often found at sushi-ya. They include, but are not limited to pickled burdock root, daikon, cabbage carrots, and many others. Otoro - oh-toh-roh) – The fattiest portion of the tuna, found on the underside of the fish. Ponzu - pohn-zoo) – Sauce made with soy sauce, dashi and Japanese citron, such as Yuzu or Sudachi. Ramen - rah-mehn) – ‘Instant’ noodles, created by extrusion and often bought in packets for easy preparation. Chinese style noodles served in broth in a bowl. Traditional Japanese “fast food.” Instant ramen invented in the 1960s and now found worldwide. Today Cup-Ramen which is even easier to make is popular worldwide. Saba - sah-bah) - mackerel, almost always served after being salted and marinated for a period ranging from a couple of hours to a few days, so really cooked. In this form it is called Shime-Saba (shee-meh-sah-bah). Raw mackerel (nama-saba) is sometimes served but it must be extremely fresh as it goes off quickly. Sake - sah-keh) – Rice wine. Pronounced ‘sah-keh’ not “sah-key.” Served both hot and cold depending on the brand type. Some people love it, some people hate it. Sake - sah-keh) – Salmon. To avoid confusion, some people say Sha-ke. Sansho - sahn-shoh) - Japanese pepper. A must with most Unagi dishes. Sashimi - sah-shee-mee) – Raw fish fillets sans the sushi rice. Sazae - sah-zah-eh) – Type of conch, not found in the US. Shari - shah-ree) – Sushi Meshi (sushi rice). A sushi bar term. Shiokara - shee-oh-kah-rah) – A dish made of the pickled and salted internal organs of various aquatic creatures. It comes in many form such as ‘Ika no Shiokara’ (squid shiokara), shrimp, or fish. Shirako - shee-rah-koh) – The milt sac of the male codfish. Shirataki - shee-rah-tah-kee) – Translucent rubbery noodles. Shiro goma - shee-roh-goh-mah) – White sesame seeds. Shiro miso - shee-roh-mee-soh) – White soy bean paste. Shiromi - shee-roh-mee) – This is the general term for any white fish, and if one asks for shiromi the itamae will serve whatever white fish may be in season at the time. Shiso - shee-soh) – The leaf of the Perilla plant. Used frequently with in makizushi and with sashimi. The sushi term is actually Ooba (oh-bah). Shitake - shee-tah-keh) – A type of Japanese mushroom, usually available dried. Shoga - shoh-gah) – Ginger root. Usually grated. Shoyu - shoh-yoo) – Japanese soy sauce. Shumai - shoo-mai) (another type) is always steamed. Soba - soh-bah) – Buckwheat noodles. Somen - soh-mehn) – White, threadlike wheat noodles. Spam - yes, SPAM!) – a sushi you can get in Hawaii (maybe Japan too), an acquired taste, perhaps. Su - soo) – Rice vinegar. Suimono - soo-ee-moh-noh) – Clear soup. Surimi - soo-ree-mee) – Imitation crab meat (also called kamaboko (kah-mah-boh-koh)) usually made from pollack. Generally used in California rolls and other maki, it’s not the same thing as "soft shell crab." Although “surimi” is used outside of Japan, most Japanese people use the term Kani-Kama, short for Kani-Kamaboko. Sushi - soo-shee)- Technically refers to the sweetened, seasoned rice. The fish is sashimi. Wrap the two together in portions and sell it as sushi, and the name still refers to the rice, not the fish. Sushi is the term for the special rice but it is modified, in Japanese, to zushi when coupled with modifiers that describe the different styles of this most popular dish. In Japan when one says “sushi” they are referring to the whole package, the sushi rice plus the neta. And this holds true for all kinds of sushi. When one wants to say “sushi rice” they say “sushi-meshi.” Also, in Japan when someone suggests going out for sushi, they are referring specifically to nigirizushi. Suzuki - soo-zoo-kee) – sea bass (of one species or another, often quite different). Tai - tah-ee) – porgy or red snapper (substitutes, though good), real, Japanese, tai is also sometimes available. Tairagi - tah-ee-rah-gah-ee) - The razor shell clam. Tako - tah-koh) – Octopus, cooked. Tamago yaki - tah-mah-goh-yah-kee) – egg omelet, sweet and, hopefully light, a good test of a new sushi restaurant, if its overcooked and chewy, go somewhere else. In Japan it is the trademark of each chef. Often potential customers in Japan will ask for a taste of the Tamago in order to judge the chef’s proficiency. Tarabagani - tah-rah-bah-gah-ni) – King Crab (the real thing, as opposed to kanikama, which is the fake crab leg made from surimi). Tataki - tah-tah-kee) - Tataki is a Japanese term which may mean seared on the outside only (as in Katsuo) or chopped up and served in its raw form (as in Aji). Temaki-zushi - the-mah-kee-zoo-shee) - Hand rolled cones of sushi rice, fish and vegetables wrapped in seaweed. Very similar to maki. Tempura - tem-poo-rah) – Seafood or vegetables dipped in batter and deep fried. Tobiko - toh-bee-koh) – flying-fish roe, red and crunchy, often served as part of maki-zushi but also as nigiri-zushi commonly with quail egg yolk (uzura no tamago) on top uncooked. Tofu - toh-foo) – Soybean curd. Tori - toh-ree) – Chicken. Torigai - toh-ree-gah-ee) – Japanese cockle, black and white shell fish, better fresh but usually frozen (and chewier as a result). Toro - toh-roh) – Fatty Tuna. There are several different types of tuna you can order in a sushi restaurant. It comes in many different grades which are from best to, well, not worst, o-toro, chu-toro, toro, and akami (which has no fat content). Udon - oo-dohn) – Wide noodles made from wheat. Unagi - oo-nah-gee) – Eel (Freshwater) – grilled, and brushed with a teriyaki-like sauce, richer than salt water eel. Uni - oo-nee) – Sea Urchin. If you are lucky you won’t like it, if not you have just developed an expensive habit. The most expensive (start saving now) is red in color, the least is yellow, luckily they taste the same. Lobsters eat sea urchin as a mainstay of their diet. Usukuchi shoyu - oo-soo-koo-chee-shoh-yoo) - Light Japanese soy sauce. Wakame - wah-kah-meh) – Dried lobe-leaf seaweed in long, dark green strands. Wasabi - wah-sah-bee) – Japanese ‘Horseradish.’ This is the small lump of green stuff that looks sort of like clay. Best done in extremely small doses. The actual rhizome is not related to American Horseradish except by name, but unfortunately, the ‘wasabi’ most often served is not real wasabi, but powdered and reconstituted American Horseradish with food coloring. Real wasabi is difficult to find in most restaurants, but is sometimes available upon request (and worth it, even with a surcharge, in my opinion). It is quite different in appearance (slightly more vegetal in color and obviously a ground up lump of rhizome, not powder) as well as taste. Real wasabi has a hotness that does not linger, and compliments and enhances the flavor of sushi rather well. Yakumi - yah-koo-mee) – A generic term for condiments.